The concept of a Jamaican bob sled team is as about as far removed from Cape Town, South Africa as I thought it could get…or is it? 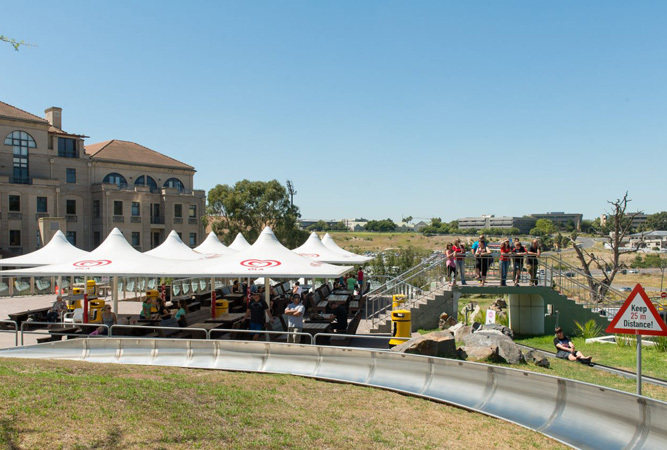 On a wonderfully warm spring day, we headed out at 08h30 on a Saturday morning, accompanied by three eager seven-year-olds, to “Cool Runnings” in Bellville, one of Cape Town’s northern suburbs. Now an early riser I am not (particularly on the weekends), neither am I an extreme sports person, but one will do anything (almost) for your first born’s birthday party! Cool Runnings is a little like the super tube, ‘sans’ water, only here you are seated in a toboggan and hauled up a steep incline to begin the 821m downward toboggan trail. Riding for seven-year-olds means flying duo with an adult, as only eight-year-olds and up may ride solo. But of course this provides an excuse for mum or dad to cuddle around little Johnnie or Susie, and ride the steel pipe adventure together! I must confess when the last stage of the incline loomed ahead, I wondered whether the cable was strong enough to haul both my son and I up to reach the summit, but pull us it did! A vital feature for the downward run is the handbrake, although the more daring elect to barely use it! At this stage my calm reassurances and idle chit-chat to my son, were converted to, “wheees!” and “whoops!” as we began our descent. Fortunately my dare devil husband had elected to ride with the birthday boy, so I got to travel with my four-year-old, at a slightly slower rate than the break neck speeds the seven-year olds demanded! I must confess that once our six minute ride was up, I was game for more and was secretly pleased that my youngest elected to ride with mum again. Things can get very warm towards midday at Cool Runnings, and one starts to long for some of that toboganning snow! It is best to don hats and loads of sunscreen and go early. Cool Runnings has a small shop where refreshments can be bought, and for birthday parties you can bring in your own cake and take-away party packs. Rides are not cheap, ranging from R13-R20 for a child’s ride and R15-R25 for an adult. The catch is that after one ride, you are certainly going to want for more! They are open on both days of the weekend from 09h00-18h00 and limited hours during the week. Address: Off Charl Cronje Drive, opposite Bellville Velodrome, Bellville, Tygervally.